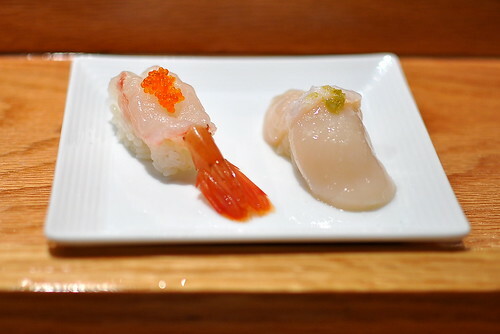 A recommendation from my friend Anne brought me to Pasadena’s Sushi Ichi. 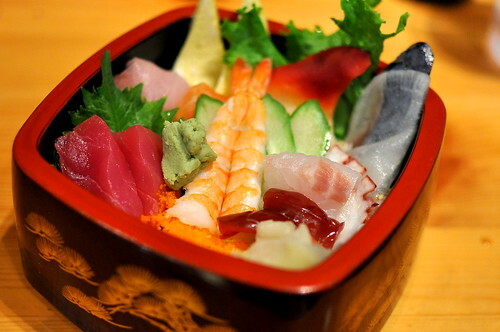 Located on the Arroyo Parkway directly across the street from the first-ever Trader Joe’s, this unassuming sushi spot makes it possible to enjoy really fine fishes without having to travel to Little Tokyo or the Westside. Pasadenians, rejoice! 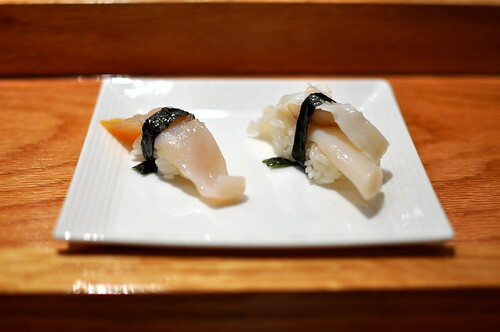 For my first meal at Sushi Ichi, my friend Lien and I opted to experience the omakase. We reserved two seats at the bar for the occasion. 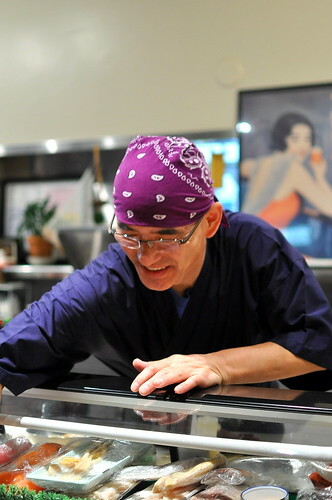 Chef Ichi is a one-man show, which can either lead to a wonderfully intimate experience or be a big ‘ol burden depending on when you visit. 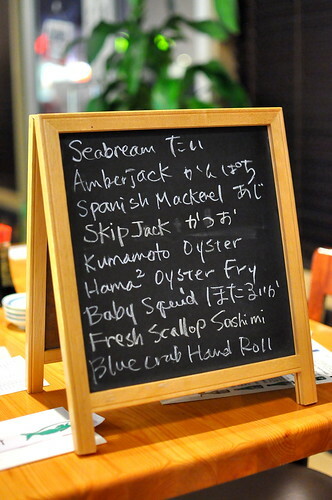 On weeknights when the restaurant isn’t too busy, fishes are quick to arrive at the table and conversation with the chef is encouraged. However, on busy nights like Fridays and Saturdays, service can be markedly slower. Plan your visit wisely, and reservations are encouraged. 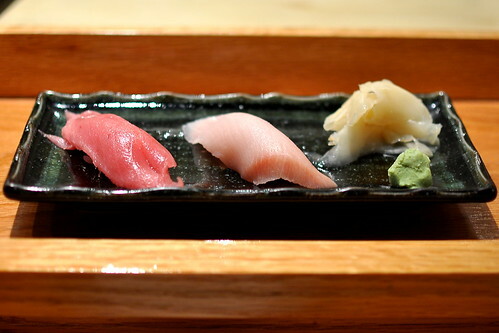 My dinner at Sushi Ichi marked a turning point in my sushi eating career. 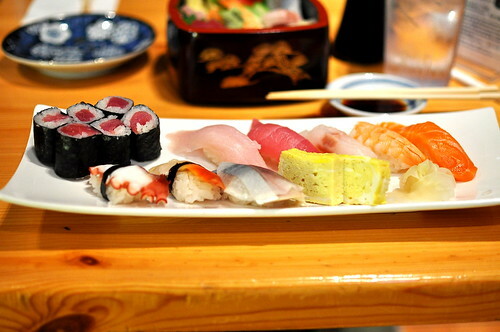 It was solidified during the meal that I am a fan of neither shiso nor wasabi on my fishes, and that I really should steer clear of endangered fruits of the sea like bluefin tuna and eel, too. These sentiments have been building over the years, but something about tonight made it all crystal clear. Future omakases will be better for this moment of clarity. 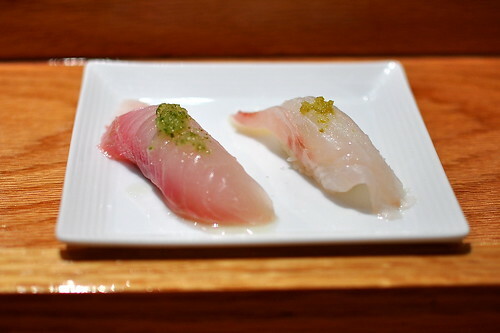 Chef Ichi started us off with gorgeous pieces of bluefin tuna (my last ever) and yellowtail. 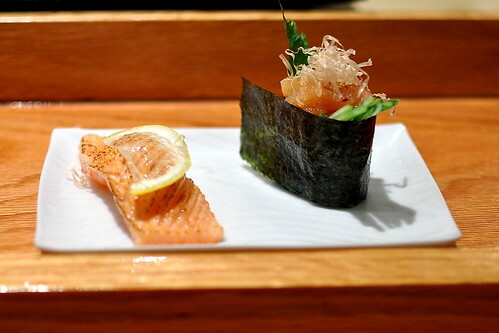 Both pieces were fresh, pristine, and impeccable, as was everything else that graced our table this evening. 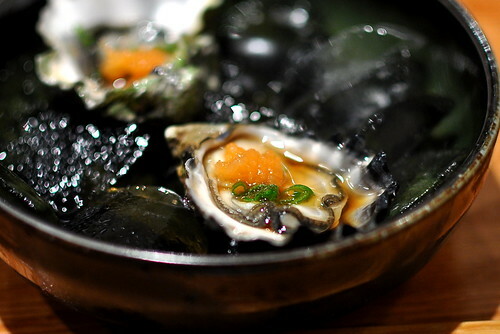 Next up were briny, beautiful Kumamoto oysters, lightly dressed with acid and scallions. 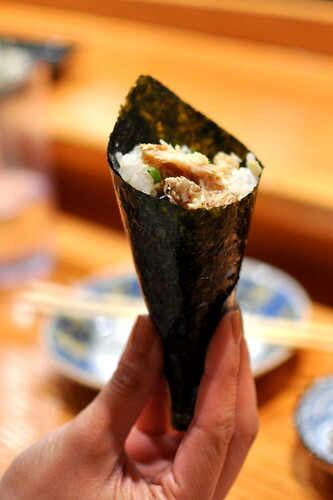 …and finally, a blue crab hand roll with shiso (my last ever, hopefully). After our stomachs declared mercy, the bill for Lien and me came out to $100 per person before taxes and tip. 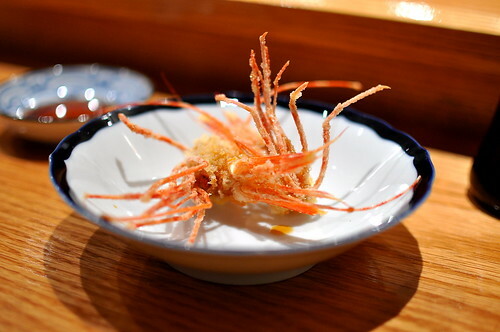 Considering the quality of the ingredients and the intimacy of the experience, the price was justified. 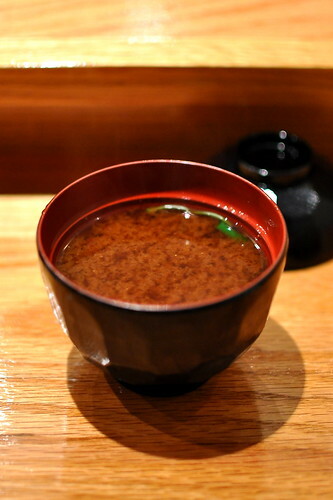 I returned to Sushi Ichi to explore the regular dinner menu with The Astronomer several weeks later on a Friday night. The wait for food this evening was significant compared to my previous visit. 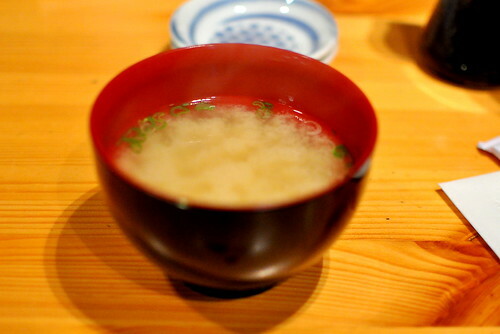 To start were complimentary bowls of soul-warming miso soup. 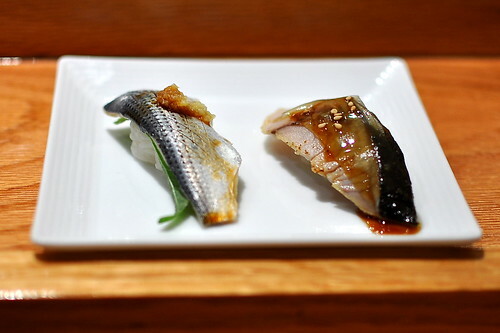 We also shared a duo of skipjack expertly garnished with red onion shavings, one of the evening’s specials. 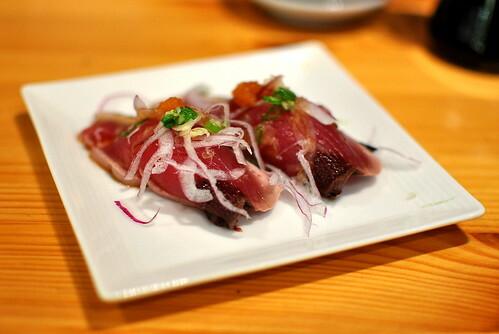 From the regular menu, we selected the beef tataki. 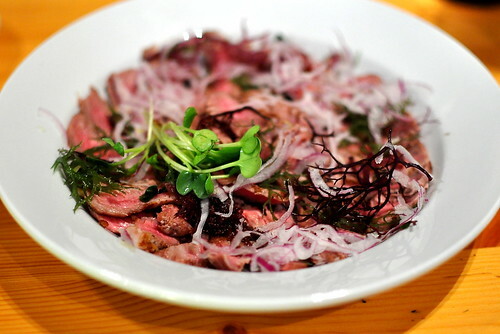 The thinly sliced, barely cooked meat came adorned with a heap of red onions and several varieties of seaweed. I was afraid that the onions would be overpowering in this dish, but I need not have worried because they fit into the beefy landscape perfectly. 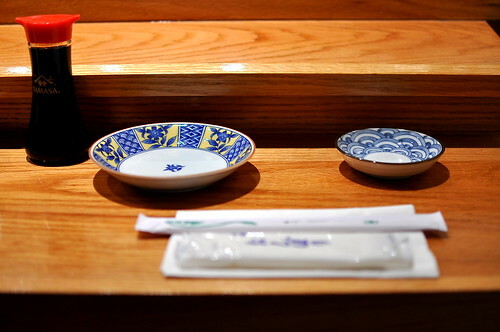 A soy-based dipping sauce was served on the side. For my main course I ordered the chirashi ($25), a veritable cornucopia of shrimp, tuna, salmon, tamago (sweet egg), surf clam, albacore, roe, and loup de mer. What really put this chirashi over the top for me were the wispy ribbons of egg and the abundance of pickles—two understated but lovely accompaniments to the seafood. The Astronomer indulged in the sashimi platter ($27), which featured a similar collection of seafood as my chirashi with the addition of a tuna roll. The Astronomer isn’t usually in the sushi mood, but tonight, this sashimi platter hit the spot. 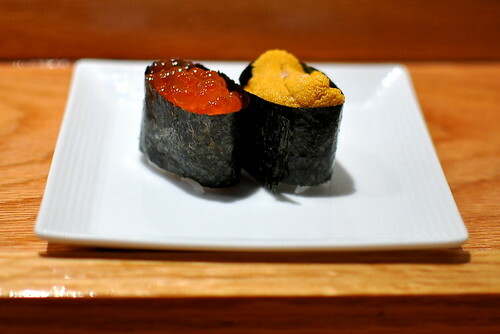 I, on the other hand, am almost always in the mood for sushi, and I’m incredibly grateful that Sushi Ichi is in the neighborhood to scratch my perpetual itch. Since this is Pasadena, how’s the parking for this place? Pasadena gets most of its revenue from parking ticket, so I tend to avoid that city on general principle unless I happen to know restaurant that has parking (for example Roscoe’s House of Waffle N’ Chicken). 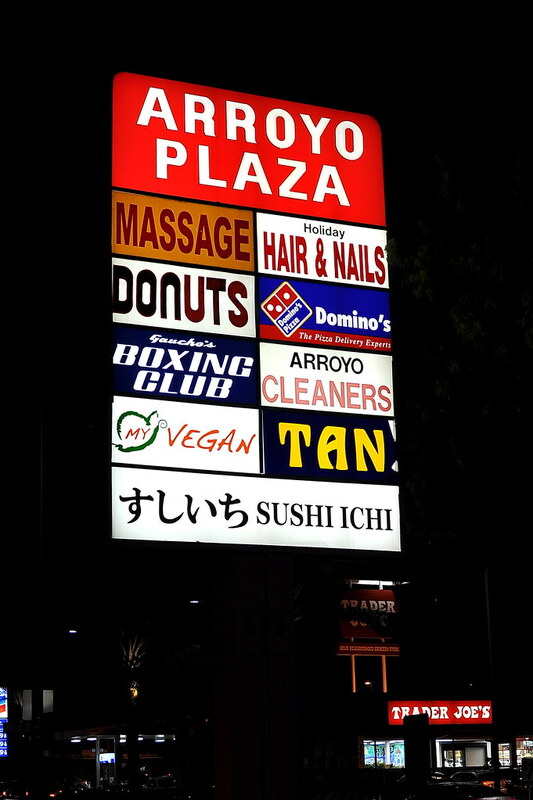 BigFire – LOL…Sushi Ichi is in a strip mall and shares a parking lot with a dry cleaning place, donut shop, etc. If the lot is full, the residential streets across the street are fair game. Good luck! Ok, I’ll definitely give this a try on a weekday. 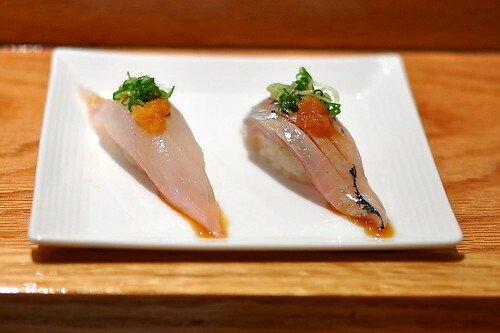 GREAT pictures and blog posts, but I noticed that you said The Astronomer had a “sashimi platter” even though the picture is of a sushi platter with just nigiri (fish on rice) and the tuna rolls. Either just a typo on your part or a serious ordering or academic error on the restaurant’s part. 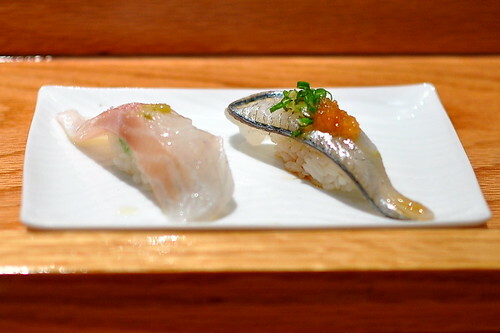 That squid might be the most beautiful piece of sushi I’ve ever seen. It really seems like Pasadena is getting its fair share of serious sushi spots…or maybe I’m just becoming more aware of them. Either way, it’s good to see! Darin – Wait’ll you see my post tomorrow 😉 More feeshes in my ‘hood!